When I first saw the photographs of Mary Redshaw’s dogs, I had no idea what breed they were. 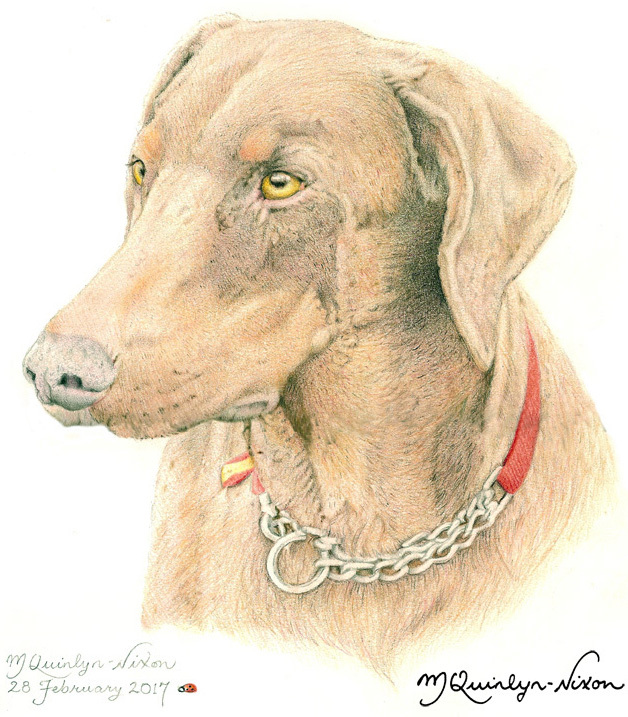 I had never seen a brown Doberman Pinscher before; only being familiar with the Anubis-like Doberman Pinschers (with the pointed ears and black-and-tan colouring), that I had seen on TV programmes, like ‘Magnum P.I.’ with Tom Selleck. After having watched ‘Magnum P.I.’ Mary’s interest in the breed was kindled. 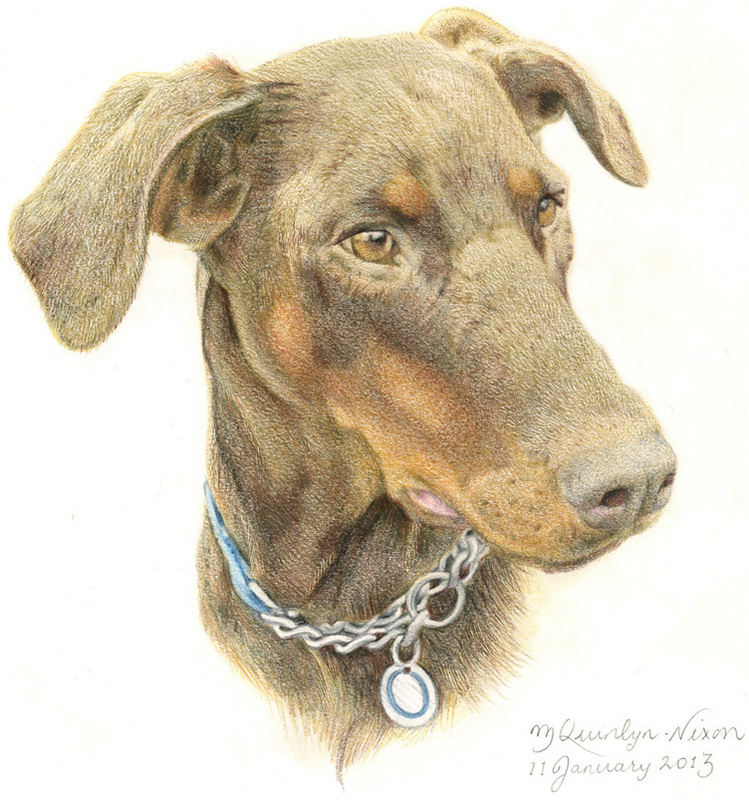 She has owned a good number of Doberman Pinschers over the years – male and female, both black-and-tan and brown-and-tan varieties. Her first Doberman Pinscher puppies were Tara in 1987, followed by Elsa in 1989 and Ziggy in 1993. She is an excellent pet-owner and takes marvellous care of her dogs; she currently has one brown Doberman Pinscher, called Dina (pronounced Dinah) and a blue-fawn-brindle-and-white Whippet called, Tina. 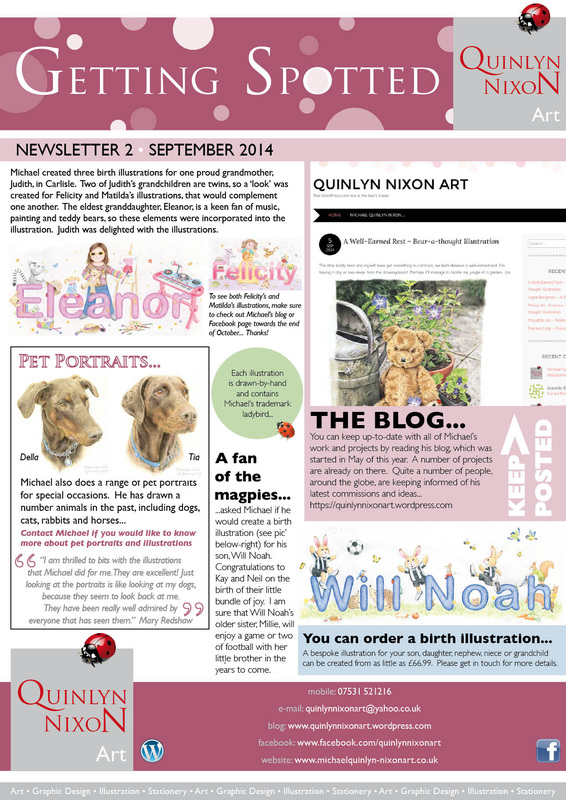 I’ve drawn a number of Mary’s dogs, including Gina and Tia over the last two years. Drawing peoples’ beloved pets, (when the pet is no longer with us) from their photographs takes time and selecting the right photograph with enough ‘drawable’* quality is paramount to the success of the end result. We chose a lovely photograph of Della, who Mary had owned from 2005 to 2012. The photograph showed Della’s gentle doe-like features and loving nature. 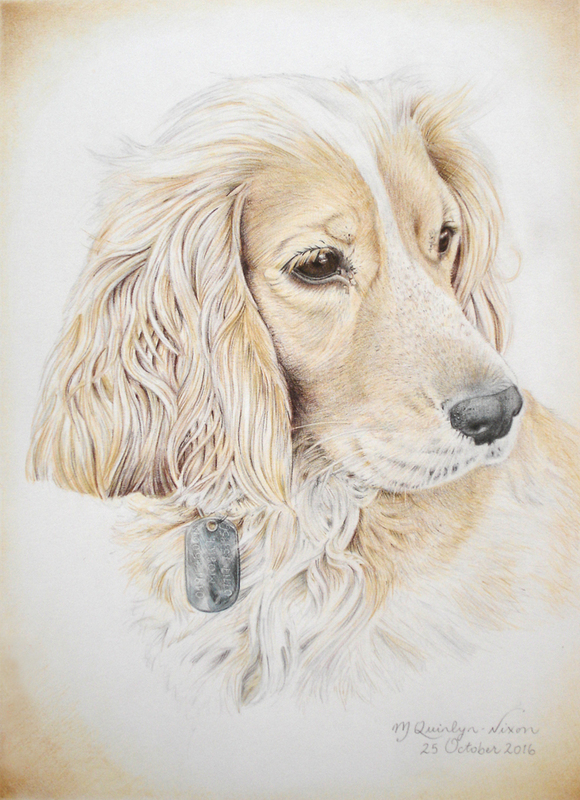 The drawing process can take many hours, as each ‘coat’ of colour builds up the fur of the dog. Mary was delighted with the result of this illustration and I have agreed to go for a long-promised walk with her and ‘the two girls’ before this month is out! *Note: “In addition to simple drawing, ‘Drawable’ provides a number of generic mechanisms for its client to interact with what is being drawn”. I thought I had made this word up, as I had never heard it before. But after typing it into a popular search engine, this explanation appeared (as if by magic! ).